As winter approaches, I am becoming less strict about my adherence to a raw diet. However, I have found I prefer many raw recipes to their unraw counterparts—I am maintaining my switch to cashew yogurt and nut milk, and zucchini hummus is just so delicious, and much easier to make than chickpea hummus. I really did miss tea, though. The criteria I use for choosing a recipe has also changed. If I had read the recipe I'm sharing today even a few months ago, I would have skipped over it, mostly because of the ingredients list. Mesquite powder and maca powder were definitely not in my cupboards at Christmas, and hazelnut pulp only entered my life with my recent switch to nut milks. Now, this is a recipe I make often, because the cookies are delicious, the process is simple and these are ingredients I always have in my cupboards. I'm not sure how I feel about the state of my cupboards. 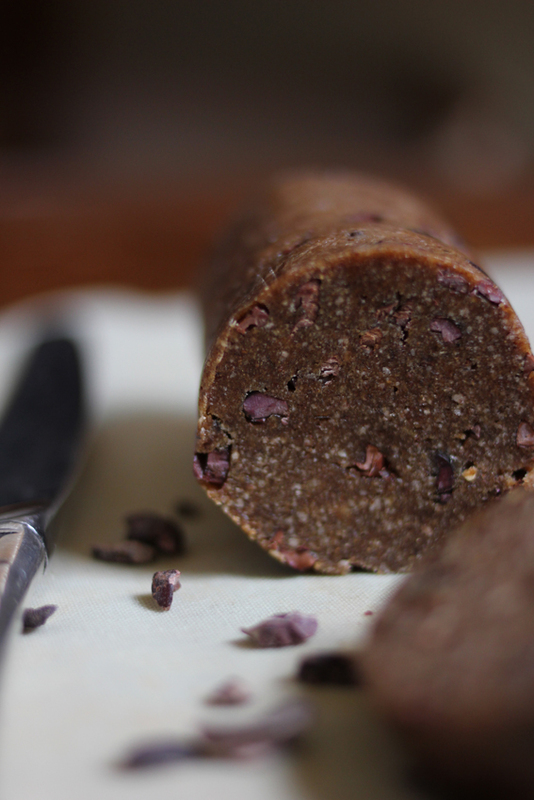 With my interest in raw food, I am anxious that I'm neglecting my interest in local food. I know the two food interests can co-exists very easily—what's more local than snacking on raw carrots from your own garden?—but often they don't. I'm still working on reconciling the two. 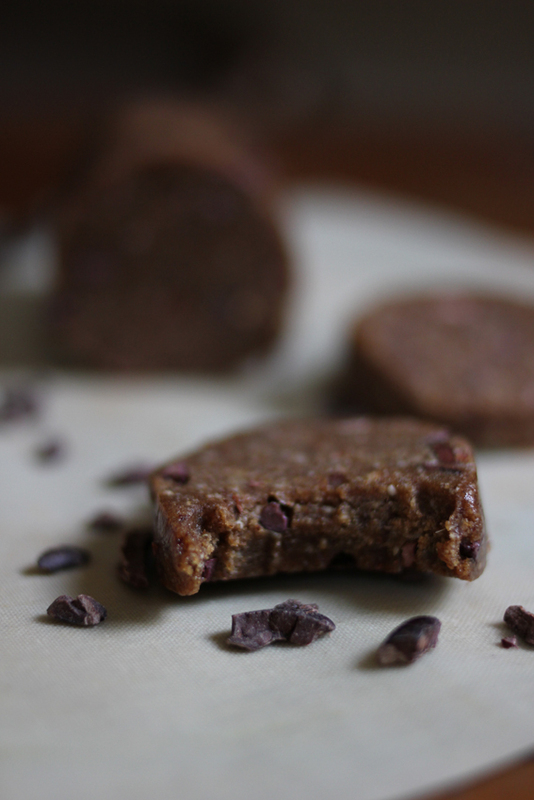 What I find most difficult is dealing with the foods that I find particularly healthful and delicious, but are definitely not local—cacao and coconut products, for example. But, until I figure all this out, I'm going to keep making these cookies. 1. Combine all ingredients in a food processor and process until a clumpy dough forms. Depending on the texture of your dates, you may have to add a tablespoon or so of water to achieve the proper consistency—it should hold its shape when you squeeze a bit in a fist. 2. 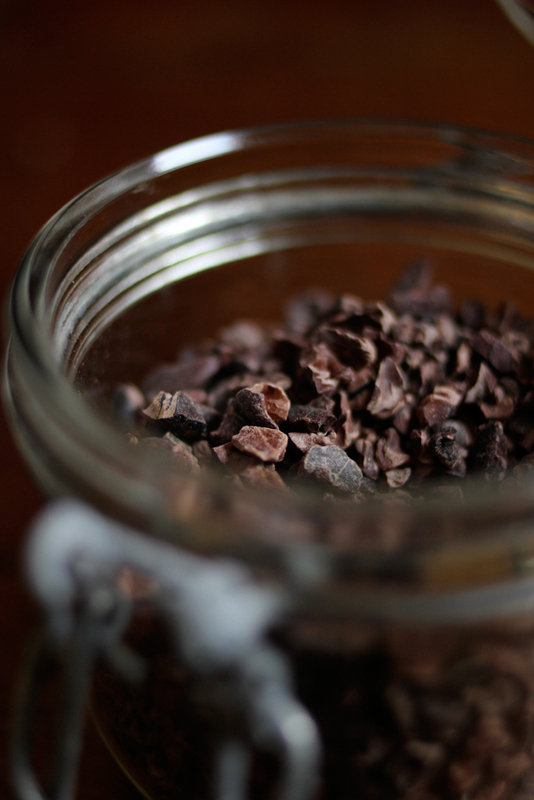 Mix in desired amount of cacao nibs by hand and roll dough into 2-3 logs. 3. Wrap and place in the refrigerator. Chill thoroughly. 4. Slice and serve straight from the fridge. Along with eating cookies, James and I have been working on making our apartment ours. 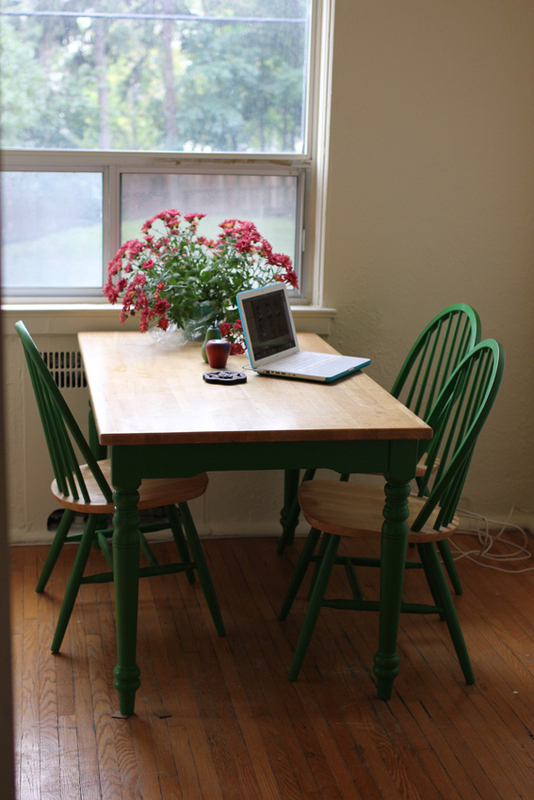 We spent last weekend painting our kitchen table and chairs. I wasn't sure at first, but I'm really happy with how it turned out. Sometimes, it's a real challenge to find a way of eating that doesn't violate one or more of my standards. But I believe that if the majority of our meals are on target, and we keep moving in the right direction (without me stressing too much), then that'll do! :-) Beautiful photos, and thanks for sharing with us! Coconut oil is the same as coconut butter. The coconut butter becomes liquid at temperatures over 23-25C. Coconut oil and coconut butter are not the same. Coconut butter is made from coconut flesh, while coconut oil is the oil extracted from the flesh—there is no, or very little, fibrous material in coconut oil. Ah, then maybe you mean coconut meat or creamed coconut. In Europe, coconut oil is the same as butter, while creamed coconut is the thick dense pulp from the coconut. Your apartment looks so pretty! I love your table and chairs! Are these the same cookies that I always eat way too much of? I love them so much! Those are the cookies! I love them too. 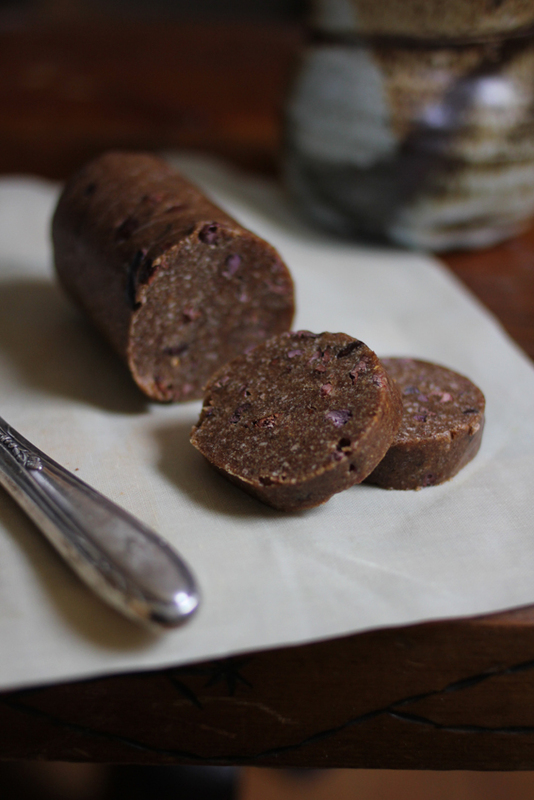 I've had something similar (but not raw) before made by some Russian family friends and it was actually really, really yummy (despite the funny name -- they call it chocolate sausage). This recipe looks really decadent -- can't wait to try it. Plus it is a good way to use up nut pulp. gorgeous photography! I must try this recipe. It sounds devine!